Clever children in tough schools should not be "embarrassed" by their ability or face taunts of being called "smart alecs", says the schools minister. 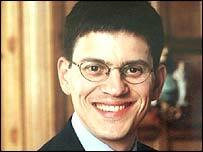 David Miliband says plans to give more help to "gifted and talented" pupils would be as important as creating the Open University in the 1960s. The minister put forward a five-year plan to allow talented children to progress in terms of their ability and not their age group. Mr Miliband said that schools would have to provide individual support for most able pupils and to recognise their special needs. Bright students have been "confronted by the very British mentality which says it's wrong to celebrate success, and worse still actively to encourage it", said Mr Miliband. "The bright student was too often embarrassed by being labelled a smart-alec. The result was at best day-dreaming, at worst frustration leading to trouble." In particular, schools in the most deprived areas had been the least likely to have support for bright children, he said. Mr Miliband's comments followed an Ofsted report showing that children attending summer schools run by the new academy for England's gifted and talented youngsters made "substantial gains". Inspectors said the quality of learning was very good, boosting the youngsters' knowledge, understanding, confidence and self-esteem. The academy is reporting high demand for its courses this summer. In 2003, only about 500 of the 900 places were taken up - "disappointingly low", Ofsted said. Inspectors suspect the poor uptake was due primarily to the fact that schools and parents were not fully aware of the academy's work. The academy is for students who can show they are in the top 5% of the ability range. In 2003, its first full year of operation, it ran 25 schemes at five universities, for children aged 11 to 16. Activities included academic sessions, visits, external speakers, practical challenges, "reflection time", private study and recreational time. Although there were pupils from most of England's local education authorities, a dozen authorities accounted for just over a third of the children. Girls very slightly outnumbered boys. Just over one-third of the pupils were from minority ethnic groups, compared with about 14% in the school population as a whole - the largest numbers being of Indian and Chinese heritage. About one in every five pupils was from an independent school, although such schools cover only about 7% of the school-age population. Their parents get no fees subsidy. Each place cost £1,700 of which the Department for Education and Skills contributed £1,100. Schools were asked to pay £270 for each of their pupils who attended although some did not. Parents made up the rest, with the fees being means-tested. This year, the academy says, people whose gross household income is less than £20,000 a year will get a full scholarship. This tapers to 10% of the cost on incomes of £40,000. Ofsted said last year's summer schools were staffed by a combination of university academics, teachers from local schools and teaching assistants. "Most teaching was at least good and some was excellent." Ofsted recommended that the academy should ensure that staff taught in a way that was effective for the age groups and types of pupils involved. It also said the academy should investigate why recruitment was below target last year. The academy thinks it has cracked this, by offering two-week summer schools as well as three-week ones. It has put on a further 150 places this year to cope with the demand, after 820 of the 900 original places were "snapped up". They will be run at its home base at The University of Warwick, along with the universities of York, Exeter, Durham, Lancaster, Canterbury Christ Church University College and Imperial College London.